As of June 22nd, I’ve been blogging for 4 years! It all started with a horrendous photo of Broccoli Salad, and I kept it a secret for quite some time. Since then, it has morphed into SO much more than I could have imagined. Food conferences, brand partnerships, freelance writing gigs, and befriending the most delightful fellow bloggers – I’m a lucky gal. And of course, keeping on par with previous years, I’m using copious amounts of sprinkles! But not just any sprinkles – Sweetapolita Sprinkles. If you ask me, they are the most magical sprinkles ever, and choosing a medley was the hardest decision of my life! I used the Buried Treasure Twinkle Sprinkle medley on these puffs. Gah, even the name of them is cute. Humble little puffs of pastry bursting with cream – what’s not to love? While perfectly acceptable in their classic state, I had to jazz things up for my blogiversary. I used a healthy dose of sprinkles in the cream filling for good measure. And if that wasn’t enough, I dipped each puff in Valrhona white chocolate and topped each quite heavy handidly with more sprinkles. Perfect for a little blogiversary celebration, if you ask me. I raise my puff to another year in the books, and to the next year of travel, eats, blogging and using sprinkles with abandon. Cheers! In a medium saucepan, heat water, butter, sugar and salt. Bring to a boil. Remove the pan from the heat and add the flour. Stir until the mixture is a paste. Return the pan to the heat and continuously stir the mixture until it's slightly shiny, about 2 minutes. You also want to make sure a thin film forms on the bottom of the pan. Transfer the paste to the bowl of a stand mixer fitted with the paddle attachment. Beat on low until the choux has slightly cooled, about 1-2 minutes. Add one egg at a time, beating until it has fully combined before adding the next. Beat the batter until it's smooth and light. Transfer the dough to a piping bag fitted with a round or star tip. Or you can scoop dough by the tablespoon. Pipe the dough into 1+1/2 to 2 inch mounds. Leave about 2 inches between each mound. Lightly dab the tops of each mound with a wet fingertip to slightly smooth the surface. Reduce the heat to 350 degrees F, and continue to bake for another 15 minutes, until the mounds are golden brown, light and airy. Immediately after removing from the oven, cut a small 'x' in the side of each puff, to allow the steam to escape. In the bowl of a stand mixer fitted with the whisk attachment, beat the cream until it starts to slightly thicken. Add the icing sugar, vanilla and almond extracts and continue to beat until soft peaks form. Add in the vanilla pudding powder and continue to beat until well combined, and stiff peaks form. Make sure you do not over-beat the mixture. Hand stir in the sprinkles. Transfer the whipped cream to a piping bag fitted with a tip of your choice *Because of all the sprinkles, I didn't even use a tip this time, just snipped a hole in the end of the piping bag and it worked great. 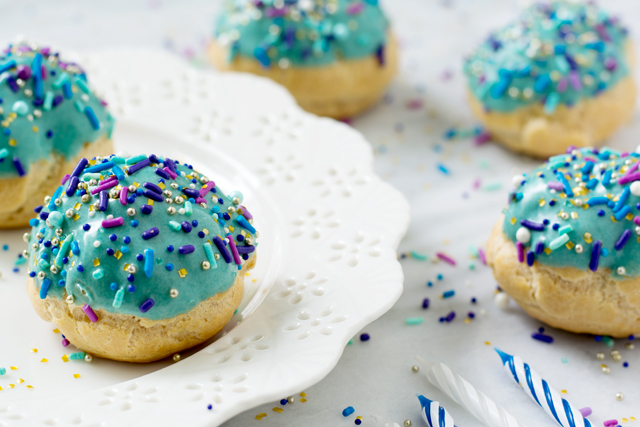 There are two ways to fill a cream puff. 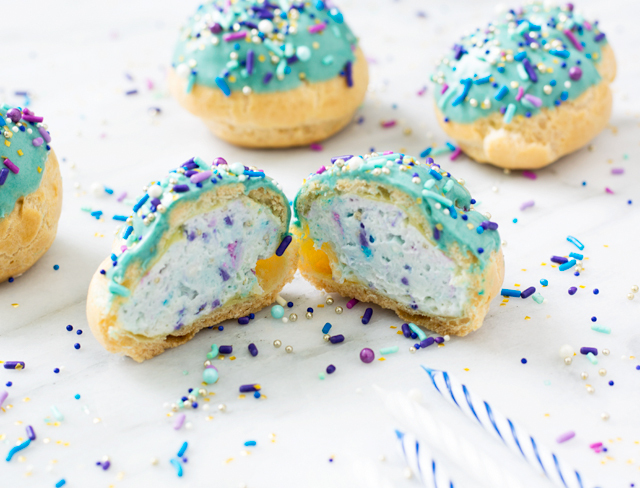 You can cut the puff in half, fill one side, and top with the other half; or, you can slide the tip of the piping bag through the small 'x' you cut into the side of the puff and gently squeeze the cream until the puff begins to overflow. The shells will remain slightly crispy for several hours, so it's best to fill these right before serving. They store well in the fridge for 2-3 days, however the shells will become soft. Once your puffs are filled, set side in the fridge. Place chocolate chips or finely chopped chocolate into a microwave safe bowl. Heat in 30 second intervals, stirring in between each interval until all chocolate is melted. Add food colouring if you wish. Dip the domed part of the puff into the chocolate and allow excess to drip off. Place on a cookie sheet and sprinkle generously with sprinkles. Allow the chocolate to completely harden before serving. These look absolutely magical and mysterious. They sound decadent with the valrhona white chocolate. 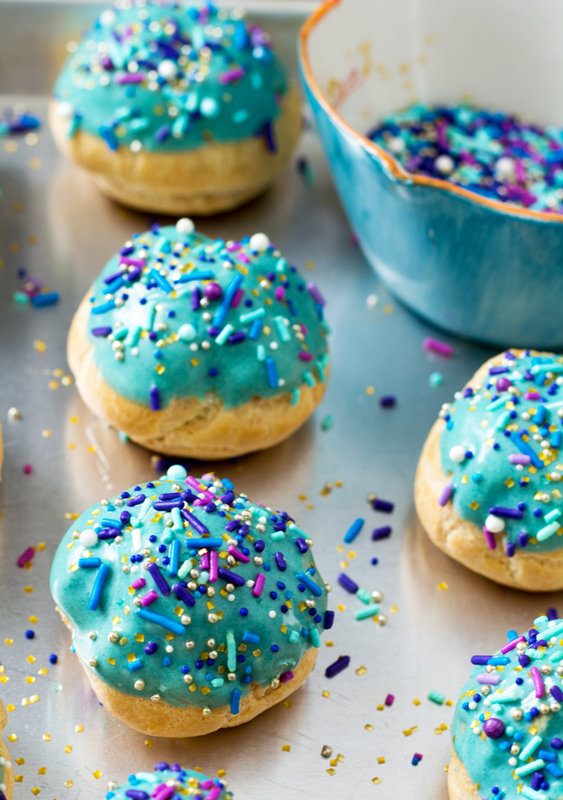 These puffs look like a lot of fun to eat and experience. Happy anniversary to you and great work on your blog. Puffs look so cool! I want all those sprinkles. Pinned. These are so gosh darn adorable. 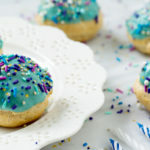 The Sweetapolita sprinkles really make it too! Thanks so much for the recipe!